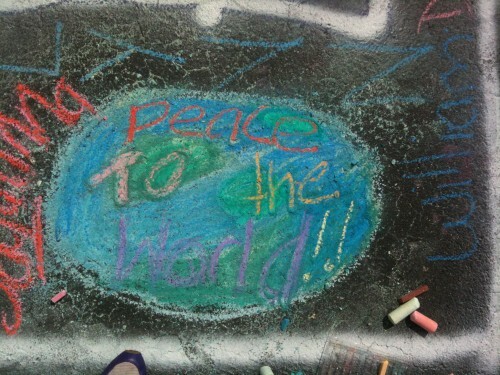 Imagine a world where everyone would choose to live in Peace and Harmony! In this particular case it was such an honor to work with organizations that have the power to spread such an important message, to Choose Peace & Stop Violence. Teaching youth to stop bullying, to choose peace over violence helps to create safe and healthy neighborhoods, vibrant with opportunities for positive change. Thank You to The African American Research Library, Chalk 4 Peace, The Urban League of Broward County and Anita Fraley from United Way of Broward County. Categories: Art In Public Places, Exhibitions, Inspirational | Tags: African American Research Library, Anita Fraley, art, broward county, Chalk 4 Peace, Chalk Art, children, community, fort lauderdale, Harmony, history, Honor, image, images, jacklyn laflamme, Lectures, Messages, Organizations, Parks, Peace, power, Pride, Recreation, Schools, The Urban League of Broward County, United Way of Broward County, usa., World Peace | Permalink. Paint The Park a community art day and resource fair was held on Saturday, September 14, 2013, to work towards the unification and beautification of a local community. 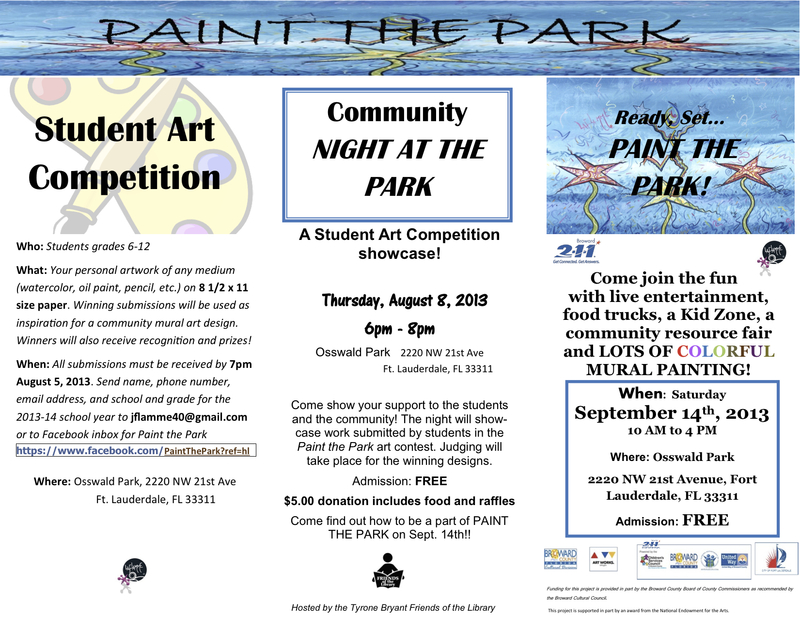 The event took place at Oswald Park, 2220 NW 21st Ave, Fort Lauderdale, FL 33311. Residents from the community and all of South Florida were invited to work with the artist to paint two murals and share in the creation of the art to renew the face of their community. The community art day finally arrived, the weather was perfect and we had an amazing turnout. Everyone grabbed a brush and and got to work as the murals emerged, we were entertained by live music and resource fair. A great time was had by all that attended! We can all make a difference, in this particular case it was inspiring to see how children, teens and adults take pride in their contribution, a sense of ownership develops when residents participate in the process. I would like to thank the City Of Fort Lauderdale and all the staff at Osswald Park for all their support, the Broward Cultural Division for helping with the grant process and an extra special Thank You to Melinda Pollard. Read more about Paint The Park the final event. 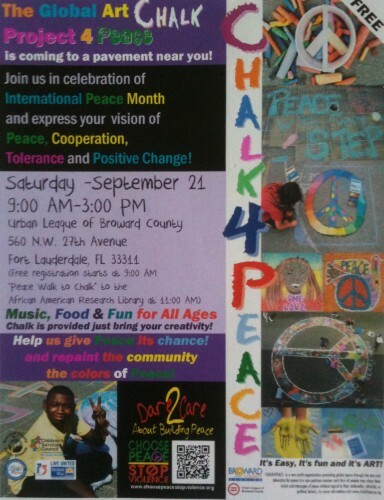 Categories: Art In Public Places, Events, Murals, Paintings | Tags: artist, arts, Broward County Florida, Chalk 4 Peace, Choose Peace, Community arts, Community Event, Entertainment, events, florida, Food Trucks, fort lauderdale, Fort Lauderdale Florida, Home Depot, jacklyn laflamme, Melinda Pollard, murals, osswald park, paint the park, painting, south florida, Stop Violence, usa. | Permalink. Congratulations to Kristina DaSilva for starting Inside Out Project – Fort Lauderdale an on going global art project that transform messages of personal identity into pieces of artistic work. The project is a collaboration between French street artist JR, The TED prize and groups throughout the world who are looking to spark conversations and generate awareness through art. The Mural located in Fat Village Arts District looks amazing! Thank You to Kristina DaSilva for starting Inside Out Project – Fort Lauderdale and to artist JR, Ted prize and all the groups throughout the world who are participating in this global event. 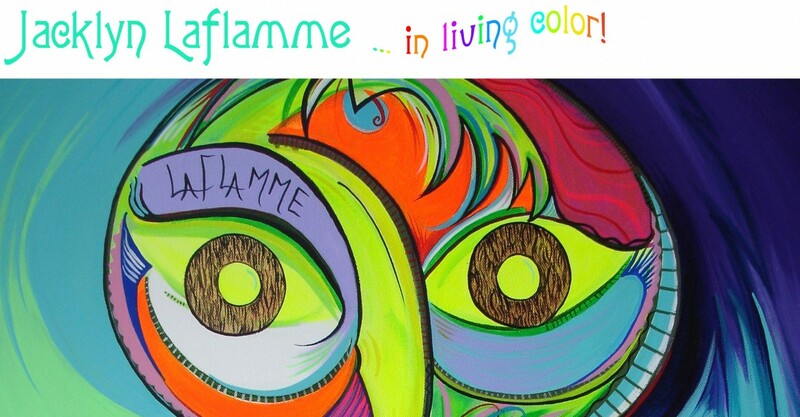 Categories: Art In Public Places, Events, Murals, Photography | Tags: art, Arts District, Artsti JR, Broward, County, Event, events, exhibition, Facebook, Fat Village, fort lauderdale, Fort Lauderdale Florida, global, image, inside out project, Instagram, installation, International, jacklyn laflamme, Kristina DaSilva, Miami, National, photo, photography, Public Art, Revel On the Block, Ted, ted prize, ted talks, Twitter, United States, UTube, World, world event, World Peace | Permalink. 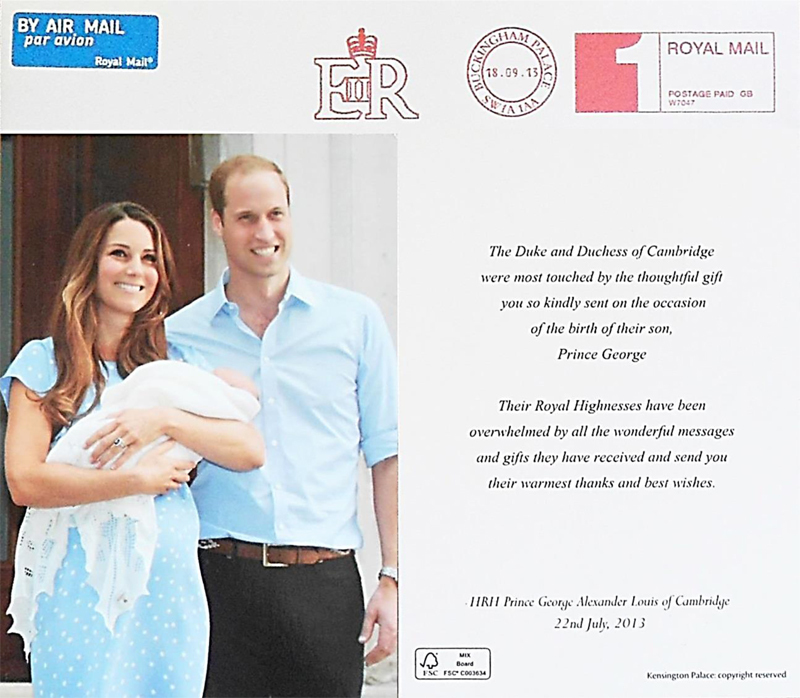 Dani Lynn and I were so excited to receive a second thank you note for the gift of The Fairy Tale Project Trilogy that we sent to Prince George. A nod, a phone call, a handwritten card, a warm sincere note to show gratitude can make someone’s day. The people you are thanking will feel fabulous about themselves and what they did to reach out to you. Thank You to Dani Lynn who works tirelessly on the Fairy Tale Project. Categories: Books, Inspirational | Tags: art, arts, awards, Birth, Buckingham Palace, Cards, children, dance, Duke & Ducess Of Cambridge, Education, fairy tales, Faries, florida, Gift, Her Majesty The Queen, Highness, history, Honor, images, jacklyn laflamme, Lectures, Messages, Music, Notes, Organizations, Parks, Postcards, Pride, Prince George, Queen Elizabeth, Recreation, Royals, School Of The Arts, Schools, Son, Thank You, the fairy tale project, Theater, usa., Visual arts, William & Kate | Permalink.